These Lily & Aloe Bath Bombs are made with aloe extract and jasmine flowers for a sophisticated and natural look. Bath bombs create a luxurious bath experience, and they are so easy to make at home. 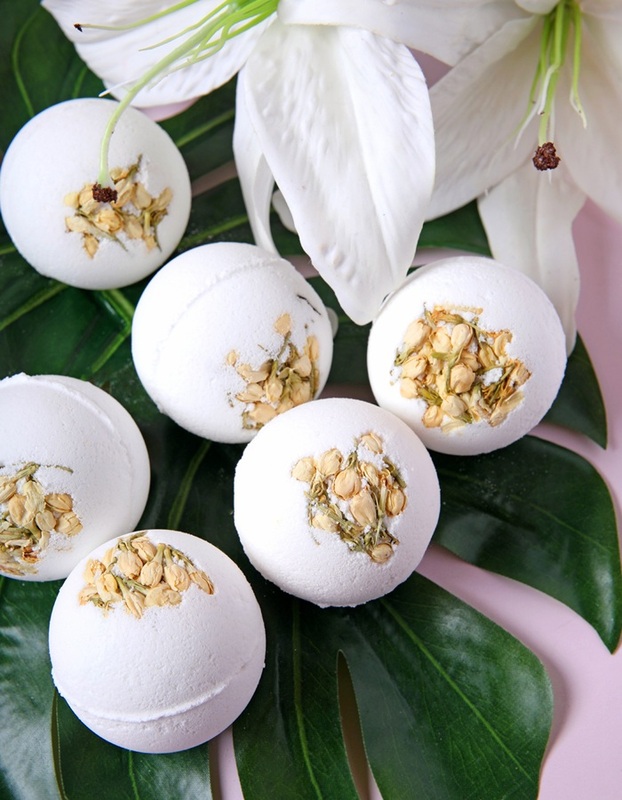 These Lily & Aloe Bath Bombs are accented with jasmine flowers for a sophisticated and natural look. They're scented with White Lily and Aloe Fragrance Oil, which is a fresh take on a traditional floral scent. It has notes of rosehip tea, lily, blood orange, and green aloe plant. A touch of aloe extract adds skin-loving properties to the recipe. The extract is dispersed in fractionated coconut oil, which has a lightweight consistency. We also added polysorbate 80, which is an emulsifier that helps oil mix into the bath water rather than pooling on top. Bath Bomb Molds create the classic sphere shape of a bath bomb. They take a little bit of practice, but we think it’s worth it. When filling them, make sure each half is full enough that the two sides stick together. Gently compact the mixture into each side and add a touch of loose powder on top. The loose powder acts like a glue to help the two sides adhere. Let the bath bombs dry and harden overnight before attempting to unmold them. The molds can be used as packaging. Bath bombs create a luxurious bath experience and they are easy to make at home. These Lily & Aloe Bath Bombs are accented with jasmine flowers for a sophisticated and natural look. They're scented with White Lily and Aloe Fragrance Oil, which is a fresh take on a traditional floral scent. It has notes of rosehip tea, lily, blood orange, and green aloe plant. A touch of aloe extract adds skin-loving properties. Push all the baking soda and citric acid through a strainer into a large mixing bowl and use gloved hands or a spoon to mix them. Add 1 ounce of aloe extract, 0.5 ounces of White Lily & Aloe Fragrance Oil, and 0.3 ounces of polysorbate 80. Use your hands to fully incorporate the wet and dry ingredients. Drop a few jasmine flowers into one half of the mold. Add bath bomb mixture and press it in firmly. Fill the other half of the mold. Place loose bath bomb mixture on top of both halves. Clear any powder from the seams of the mold, match the eyelets, and close. Make sure to direct pressure on the seams to prevent dents.